Husqvarna Viking is most often recognized for its powerful yard tools. However, this company has been a force in the sewing sphere since 1872. 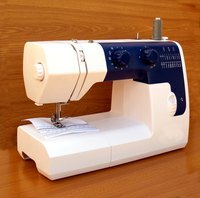 With the Husqvarna Zig Zag in 1947, Husqvarna secured its place in the modern sewing world and has since maintained a strong market presence by providing a consistent product that is reliable and simple to use. The Husqvarna 105 was produced as an upgraded model to the Husqvarna Viking 95. The manuals are printed together and the machine has proven to be a simple and reliable model. Locate the spindle on the back of the machine. Place a spool of thread on the spindle. Pull a length of thread out from the spool. Thread the bobbin with the thread on the spindle. Place the bobbin on the bobbin threader, located on the top right of the machine. Depress the foot pedal to power the bobbin threader. When the bobbin is full, release the foot pedal and cut the thread between the spool and the bobbin. Thread the bobbin into the bobbin case. Pull an inch of thread through the bobbin case and place the bobbin in the machine. Pull a length of thread from the spindle located on the back of the machine to the rear thread guide. As the thread passes the rear thread guide, the guide will utilize the natural tension to pull the thread up into the guide, holding it in place. Pull the thread toward the front of the machine. Locate the "Tension Plate Thread Guide." Pull the thread down the right side of the guide. Loop the thread across the tension plate by pulling the thread up, along the left side of the tension plate. Hook the thread through the take up lever. The thread will slide into the take up lever by gliding the thread through the lever. Pull the thread down toward the needle. Ensure the thread slides through the "thread guide." The guide is a small metal loop on the front of the machine. Thread through the eye of the needle. Be sure to pull a length of thread through the needle — usually about two inches. Turn the hand wheel to thread the bobbin and needle together.